Thanks for sharing with us your idea. I am trying to get rounded borders for a JPanel in one of the projects I am working on. I am not able to get it to work. Could you please give me an example how I could use your class to do this? ...as if you don't the whole bounds of the component will automatically be filled in the background colour by the Swing painting system. 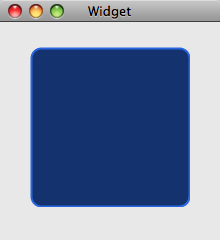 If you have done that then try and subclass your panel and add a new paintComponent() method to draw a few shapes. This should help you get the hang of things without using the code here. Once you have done that then you should be able to move forward and draw a large rounded rectangle at the back of your component.